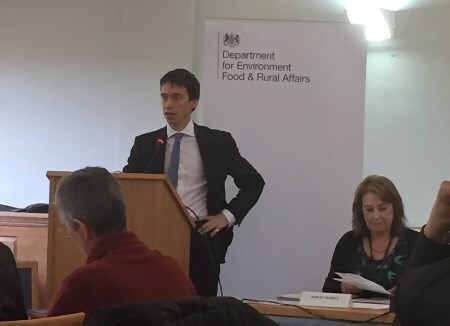 On 15 October ICF Policy and Development Officer Alex McAuley attended the National Forestry Forum at the Department for Environment, Food & Rural Affairs, where the Government outlined plans for a 25 year Open Environment Plan. Alex discusses what this means for UK Forestry. The National Forum seemed to principally provide an opportunity for Forestry Minister, Rory Stewart, to outline his visions for the forestry sector and an opportunity to introduce the Governments Open Environment Plan. Launched the previous day, the new plan aims to improve Britain’s natural environment over the next 25 years. The Minister provided his initial reflections on forestry, which was underpinned by his strong belief that trees are an essential part of our national identity. It was interesting for ICF members to note that the Public Forest Estate (PFE) is likely to remain and be protected by future legislation. It was good to see that there was an appreciation of past concerns around the PFE. The Minister went on to highlight his commitment to extend natural capital approach for woodlands, which recognises the tremendous social, economic and biodiversity benefits of trees. at the National Forestry Forum. I was delighted to have the opportunity to ask the Minister a question concerning devolution. While the Institute is fully aware that forestry is a devolved matter, we believe that it is essential that the commission and provision of Forest Research is GB-wide. The Minister acknowledged the importance of this and is of firm opinion that cross-boundary cooperation is unlikely to be an issue. He is keen to work with the sector to ensure this happens. It is now essential that the sector engages with Defra concerning the proposed 25 year Open Environment Plan (confusingly, separate to the food and farming plan). Launched by Elizabeth Truss, Secretary of State, on the 14 October, she said emphasis would be placed on a “move away from the jumble of contradictory targets and controls towards harnessing the British passion for nature and giving people the tools to achieve improvements themselves”. However, it is somewhat frustrating that farming, the environment and forestry are unlikely to be encompassed into one strategy, despite these disciplines being increasingly inter-connected. A much more favourable approach would be an holistic 25 year land use strategy based on natural capital, which encompasses the production of food and timber while protecting and enhancing the environment. I believe that it is vitally important that any plan builds on existing resources and functions rather than a duplication of efforts. The plan will need to go beyond Defra and seek to influence a number of government departments, as the role/opportunities of forestry is clearly cross cutting. I hope that the proposed Open Environment plan will give forestry the recognition that it truly deserves. There appears to be a greater appreciation of importance of sector – however, rather than relying on carefully crafted speeches, the ICF Executive Director and I will continue to protectively engage with policy makers/civil servants to ensure this becomes reality. If you would like to read the Open Environment speech (which outlines the Government’s objectives) delivered by Elizabeth Truss, then please visit the government website. Quicker approvals, increased need for professionalism?